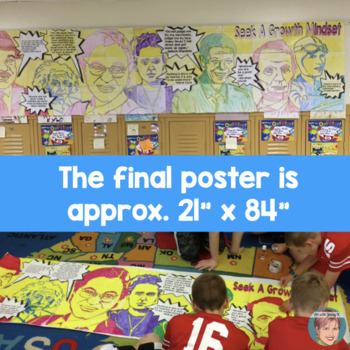 My original Famous Faces® of Growth Mindset collaborative poster is perfect for setting your classroom tone for the school year or the new year! This collaborative poster activity produces a large (7 ft long!) poster, with individual contributions from each student, featuring inspirational quotes from famous persons meant to encourage a growth mindset! • Martin Luther King Jr. This poster pairs perfectly with my Unscramble the Growth Mindset Portraits. This growth mindset poster/banner (or bulletin board idea) stands alone, or can be connected to my Growth Mindset Collaboration Poster Volume 2 to make an extra long display that is perfect to hang in a hallway as inspiration to all who pass by! All my collaborative posters are easy for teachers and fun for kids and make a lasting impression--on students, parents and your entire school community! Large and visually striking, this poster is the perfect accompaniment to your growth mindset lessons and makes for a great display in the front office, the auditorium, a hallway, or your classroom. No matter where it ends up hanging, it will engender unending compliments while proving a source of inspiration! The collaboration of this growth mindset poster makes such an impact without really having to say anything - every single piece of the poster matters - just as every child in the class matters. Your students will walk by and say "I did that piece" each time they see the poster. They take great pride in being part of this art project. Differentiation is built into the design of this growth mindset activity. Some pages have more to color than others so some kids will easily be able to color two pages. There are large sections behind the quotes that get left white. Other pages have a lot of little details to color. You can use this to differentiate and provide the appropriate experience for each child to achieve success and be part of the group. ~There are 3 rows and 12 columns for a total of 36 pieces. ~The final growth mindset poster is approx. 21” x 84” when complete. ~This growth mindset poster is ideal for a large bulletin board or a hallway. ~Each growth mindset poster piece fits on a normal 8.5” x 11” piece of paper. ~Use markers, colored pencils or crayons. ...and Lots and Lots and Lots of Yellow! *Note: If you plan to laminate this Growth Mindset poster don’t use crayons because often times the heat from the laminator will melt the wax from the crayons and ruin the poster. The color key of this poster is a tiny bit complicated so I created 2 variations to make this is easy for you as possible. The final poster of BOTH are the same - the difference is the color key at the top. 1. 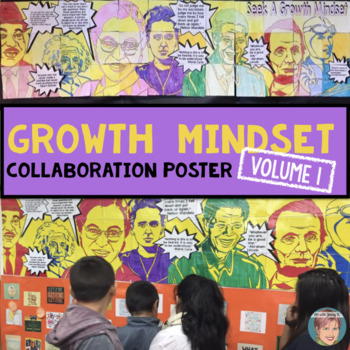 The first version of the growth mindset poster has the color key in black and white with instructions and notes printed at the top telling the students exactly what they need to do on their page (see preview for examples). You will need to print the page in black and white for this option. 2. The second version of the growth mindset poster has the color key actually in color. If you have the ability to print in color please use this poster. 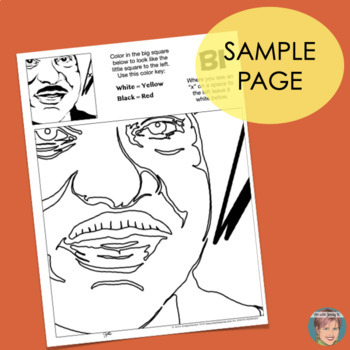 It will be easier for students to know exactly how their piece should be colored. It's also really helpful for smaller children who might not yet be able to read and will save you from having to run around the room reading the different instructions to the kids (see preview for examples). I hope your students enjoy this Growth Mindset poster! I always love to see what they make so feel free to email me or tag me on social media when you share this project! If you are new to growth mindset you might find my FREE growth mindset "Teaching Video FOR Teachers" helpful to you. Help me keep the price low by purchasing additional licenses for any teacher you would like to share this lesson with. Unique Back to School Resources!!! I have many collaboration projects in my store: Portraits,math posters,holiday posters and lots more! Thank you for making art with your students! © Copyright 2016 Art with Jenny K.® ALL RIGHTS RESERVED. 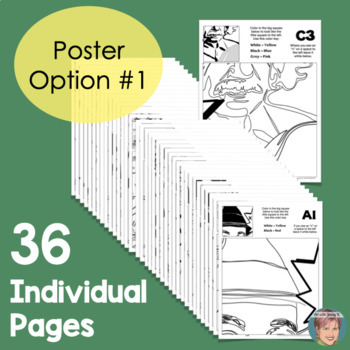 Permission is granted to copy pages specifically designed for student or teacher use by original purchaser or licensee. The reproduction of any part of this product is strictly prohibited. Copying any part of this product and/or placing it on the Internet in any form (even a personal/classroom website) is strictly forbidden. Doing so is a violation of the Digital Millennium Copyright Act (DMCA).